You want to see something scary? I mean, really scary? Then watch the new Attack on Titan trailer. This isn't a horror movie, but it sure looks terrifying, as this latest sneak peek at the Japanese manga and TV anime adaptation comes roaring to life on the big screen. If you weren't excited about this blockbuster export, you might be now! As this single teaser packs more thrills than most of this summer's American movies combined. And you certainly don't need to understand the language to enjoy it. In Attack on Titan, The sudden arrival of the Titans, mysterious, gigantic humanoid creatures who devour human beings one after the other, brings mankind to the brink of extinction. Fast-forward more than 100 years later. What remains of the human population now live in relative peace behind massive walls that were erected to defend themselves against the Titans. Yet once again, that peace is shattered when a Titan measuring over 50 meters tall smashes through the wall, allowing a horde of other Titans to enter. The protagonist, Eren, had been resigned to a life confined behind these walls. 'Nothing I do would make a difference', he thought. But when he joins the "Outer Wall Restoration Team" set up to fight against the Titans, he is reunited with Mikasa, a childhood friend and someone he had long rued not being able to save. The new recruits embark on a mission to obtain explosives, which had become rare and precious, before getting past the waves of Titans to plug the gaping hole in the wall, with humanity's survival on the line. Will there be a future for Eren and Mikasa, and for mankind itself? 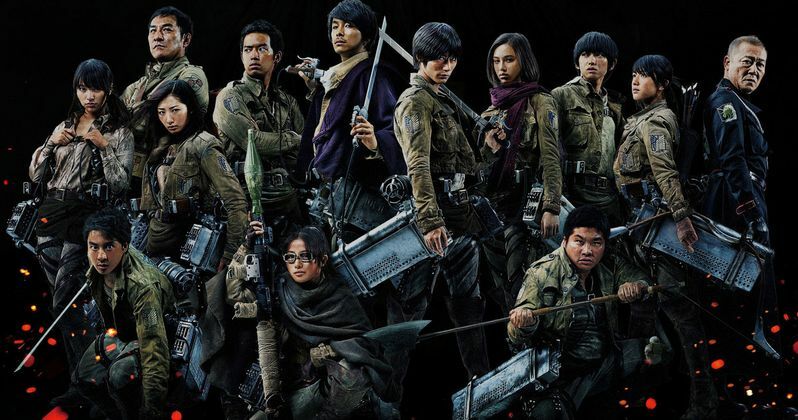 Attack on Titan features an all-Japanese cast, which includes Haruma Miura, Kiko Mizuhara, Kanata Hongô, Satomi Ishihara, Nanami Sakuraba, Takahiro Miura, Hiroki Hasegawa, Ayame Misaki, Pierre Taki and Jun Kunimura. FUNimation Entertainment has already announced that the movie will be hitting American shores this fall. Before today, we've seen both Japanese trailers and a full-length American dubbed trailer. Anyone who has difficulty following any of the trailers, though, must not have a firm grip on visual storytelling, cause it's all laid out quite clearly in the terrifying images. This latest sneak peek relies less on setting up the characters and more on the horrors at hand. The main story was set up quite nicely in the previous trailer. Anyone interested in the property, yet not familiar with all it has to offer, should go back and take a look at that. As you might notice, the film has a modest budget, and the visual effects might not be on par with what Marvel delivers every summer. But that only adds to the quaint beauty and awesomeness of this spectacle as it rises from one epic moment to the next. The Titans are displayed as massive beasts who can only be killed by their one weak spot, which is on the back of their neck. The only way to reach this is very dangerous. You can't really tell, though, in this very cool new Attack on Titan trailer. Attack on Titan is being split into two-parts, and the anticipation amongst stateside fans is just as ferocious as it is in Japan. In this sneak peek, we clearly get to see the Titans exacting their rage as they destroy the world, and some might consider it glorious. Even in the small space of watching it on a computer or mobile screen, you get the sense that this will be awe-inspiring on the big screen in 3D. So, dive in and get a taste for all the violence, action, disturbing visuals and blood-red gore this sucker has to offer. At one point, you even get to go inside the mouth of a Titan! The first half of Attack on Titan hit Japanese screens on August 8, with the second half coming September 19th. The U.S. release date has not yet been announced, but hold onto your seats! It's definitely coming. Until that time arrives, take a look at enjoy!